APMS Model School 6th class Entrance test Notification 2018-19, How to apply on Online at apms.apcfss.in for APMS CET 2018 Model Question Papers with Answers Download. AP model school admissions 2018 APMS apply online to 6th class, Andhra Pradesh School Education Commissioner Mrs. K.Sandhya Rani has released Notification of AP Model School (APMS) 6th Class Admissions Schedule 2018-19. 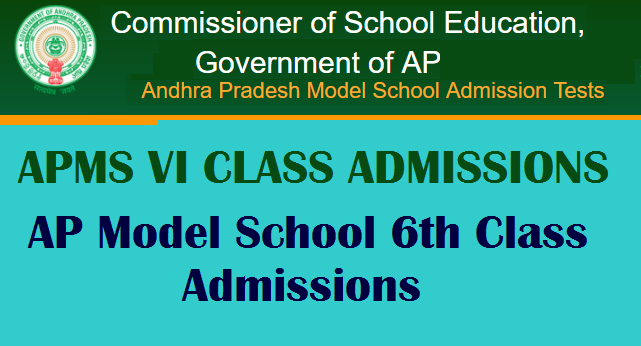 Andhra Pradesh Model School (APMS) admission into class VI the academic year 2018-19 Schedule includes Date of Notification, Application Start Date, Last Date, Entrance Test Date, Application, Online Form etc., AP Model School notification 2018 APMS admissions, AP Model School notification 2018 released at official website @ apms.cgg.gov.in. AP Model School 6th class admission test 2018 is the examination to offer admission in 6th class. AP Model School Society conducts the AP Model School admissions 2018. As per RC No 550 Dtd. 5/1/2018 Students need to apply online before 16th February 2018 on Websites apms.cgg.gov.in or cse.ap.gov.in Candidates can check AP model school admission notification 2018, apms application 2018-2019, apms school website, apms school admissions 2018-2019, ap model school application online 2018, AP model school notification 2018, apms 6th class exam date, ap model school hall tickets 2018 and ap model school results 2018, AP model school admissions 2018 through this website..
Andhra Pradesh School Education Commissioner Mrs. K.Sandhya Rani has released Notification of AP Model School (APMS) 6th Class Admissions Schedule 2018-19. Andhra Pradesh Model School (APMS) admission into class VI the academic year 2018-19 Schedule includes Date of Notification, Application Start Date, Last Date , Entrance Test Date, Application, Online Form etc., As per RC No 550 Dtd. 5/1/2018 Students need to apply online before 16th February 2018 on Websites apms.cgg.gov.in or cse.ap.gov.in DSE AP is inviting apms application from 2018 the interested candidates who are aspiring or seeking for admission into 6th class and few vacancies in 7th class to 10th class. The authority is going to conduct the ap model school admission test on April 8th, 2018 for the session 2018-2019. Students can download the AP Model school Notification 2018 from the official web portal apms.cgg.gov.in. AP model school application 2018 link is activated from 10th January 2018, which is given below if you want to apply through online mode. The Model School scheme aims to provide quality education to talented rural children through setting up of 6,000 model schools at the rate of one school per block as the benchmark of excellence. Admission for classes VI to X shall be done as per Residential Schools guidelines. The candidates from the same Mandal where Model School is functioning will be given preference. Admissions will be done on the basis of entrance test. 1. Students studying in Telugu / English Medium are eligible to appear for the AP Model school 6th Entrance Test. 2. The student should have studied continuously in the respective district for the two academic years (2015-16 and 2016-17) in a Government school or in a school recognized by the Government. 4. The candidates can apply to any AP Model School of the district for which he / she belongs. AP Model School 6th Class Admissions Schedule Released. Andhra Pradesh Model School (APMS) admission into class VI the academic year 2018-19 schedule released. As per Rc no 550 entrance test notification newly located English medium schools this academic year. Students apply online before 16-02-2018. SC / ST students should have born between 01.09.2003 to 31.08.2007 and OC / BC / SC-Converted Christians (BC-C) should have born between 01.09.2006 to 31.08.2008. The total marks for the test are 100 and duration of 2.00 hours (i.e) from 9.00 AM to 11.00 AM. Search Tags: AP Model school admissions Online Application form 2018, APMS Notification 2018, AP model school 6th admission test 2018 notification, How to Apply AP Model School Application Form 2018, AP Model School Hall Tickets 2018, APMS Results 2018 AP Model Schools Entrance Test 2017 Schedule, Eligibility Criteria, Selection Procedure, How To Apply, Online Application Form, Exam Date, Last Date For Apply APMS.